At the recent ATTD Conference in Berlin, Medtronic shared its latest automated insulin delivery and CGM product plans. Medtronic shared positive results recent study results showing that the MiniMed 670G automated insulin delivery system (AID) reduces A1C and increases time in range (70-180 mg/dl) in children 2-6 years old. Did not experience any severe hypoglycemia or diabetic ketoacidosis (DKA). These positive results were very similar to the already launched age group 7-13-year-old study group. The MiniMed 670G automated insulin delivery system (“hybrid closed loop”) is currently approved in the US, Europe, and Canada for people with type 1 diabetes ages seven years and older. Medtronic announced that 2-6 year-old approval for the 670G will launch within “1 year” (i.e., by early 2020), adding Bluetooth connectivity to display data on a smartphone app. A caregiver app will also be available for remote monitoring, offering peace of mind for parents. In addition to the 2-6-year-old 670G with Bluetooth, the following next-gen products were also framed for launch within “1 year” and “2+ years.” That said, many companies (Medtronic included) can change timelines as products get closer to market, so these are estimates for now. MiniMed 780G: This second-gen automated insulin delivery system will add automatic correction boluses for high blood sugars, in addition to the current basal-rate-only adjustment in the MiniMed 670G. This is expected to enable a higher time-in-range of over 80%, with a lower average glucose of 135 mg/dl. (For context, the MiniMed 670G achieves a time-in-range of around 72% and an average glucose of P-Glucose 8,5 mmol/l) Matching Tandem’s t:slim X2, the 780G will also allow users to update their pump software from home, meaning access to the latest algorithm updates without needing a new pump. Finally, Medtronic plans to dramatically reduce Auto Mode exits (by 10x) and cut the number of alarms in half. Overall, the 780G looks to be an incredibly user-friendly device – enabling even more time-in-range with less burden. 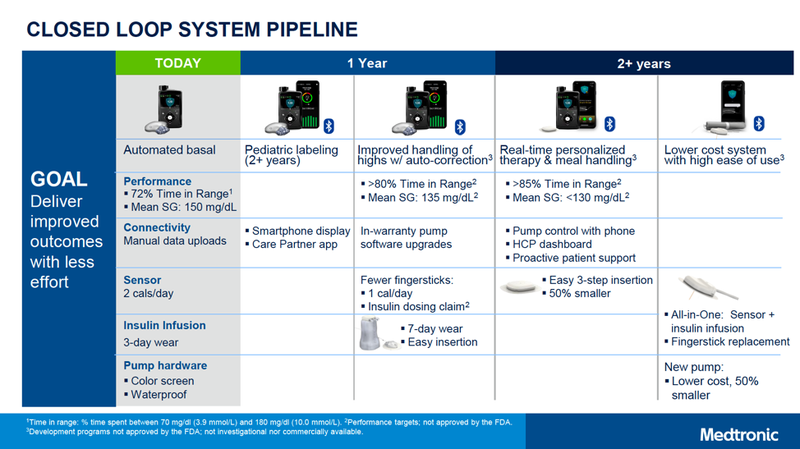 Seven-day wear infusion set: This is Medtronic’s boldest pipeline project, bringing a dramatic improvement over the current standard 2-3-day-wear infusion sets. Although no details have been shared about this new set’s technology, and we have not seen any data on the success of this project, it is a promising improvement that may greatly reduce burden for people with diabetes. CGM with fewer fingersticks: The improved CGM would be approved for dosing insulin (without a confirmatory fingersticks), and would only require calibration on the first day of wear. Mio Advance infusion set in the US? The one button, automatic application, fully hidden needle inserter has been available in Europe for over a year – we hope to see a launch in the US sometime soon, as the device has been FDA cleared for 11 months. This infusion set inserter has received outstanding reviews, including from our own team – Adam has tried a couple and finds it dramatically less painful and simpler than inserting current sets. Personalized closed loop: Aiming for greater than 85% time-in-range and an average glucose of less than 130 mg/dl. This system will add advanced algorithms, which will do a better job of handling meals and adapting to the individual person’s needs. Smartphone app control: Ability to control pump (e.g., take a bolus) from a user’s own smartphone app. A lower-cost, 50% smaller pump: This is likely several years away from market, but would be exciting for expanding the number of people willing to use pumps. All-in-one CGM sensor and insulin infusion set that eliminates fingerstick calibration. The set would combine the sensor and insulin infusion catheter under the same patch on the body.